Edgardo joined StreetSquash in 2013. He graduated from Hobart and William Smith Colleges in 2013 with a BA in Psychology. While at Hobart, he competed on the varsity squash team and was captain his senior year. Before joining StreetSquash, Edgardo worked as the project manager at NUSEA, managing camps, tournaments and events. 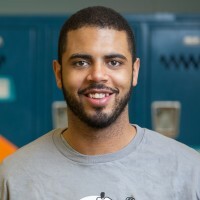 Edgardo served as StreetSquash Americorps VISTA Outreach Coordinator before transitioning to his current role in 2014. Edgardo is a proud CitySquash Alum (’09).